The new 8PSK modes are very interesting. 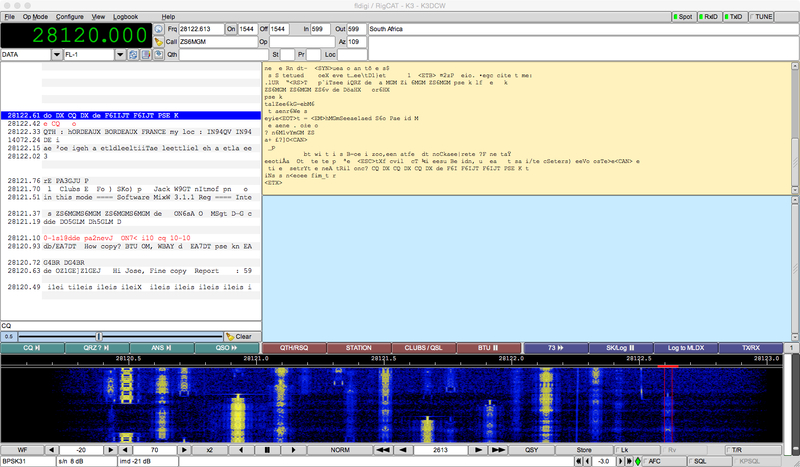 For example, 8PSK250 allows 620wpm throughput while running 250 baud, thereby keeping in line with the FCC 300 baud restriction. For those in countries without baud rate restrictions, the 8PSK1000 modem supports a throughput of 3300wpm in a bandwidth of only 1000Hz. Combine these new 8PSK modes with the capabilities and flexibility of the numerous multichannel modems previously introduced in Fldigi, and you have a wide selection of robust and very effective high-throughput emissions, available in an open-source and cross-platform package, with no associated proprietary hardware or software cost. For a complete list of updates made to Fldigi for the v3.22.00 release, please checkout the change log. As before, Fldigi v3.22.00 for OS X continues to support both PowerPC and Intel chipsets; however, separate downloads are available for each so make sure you download the correct version. Fldigi can be downloaded from the W1HKJ download page. In addition to the new version of Fldigi, the development team also announced the availability of new versions of the associated Flmsg and Flrig applications as well. These can also be downloaded at the link above.